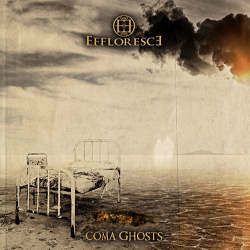 Effloresce from Nuremberg are deeply into progressive metal and number bands like Dream Theater, Opeth, Epica and Porcupine Tree among their influences. In late 2009 they released a first EP with three songs, before they are now back in early 2012 with their first longplayer Coma Ghosts. To keep everything very professional, they hired Dan Swanö to mix and master the album. After a short and rather gentle intro, things start out loud pretty soon. Crib offers powerful blasts and crunchy riffs, but also has room for melodic parts. With all the regular songs ranging from eight to sixteen minutes, there is always enough space for numerous ideas that always manage to catch the listener by surprise. For instance I was quite taken aback when I discovered on Spectre Part 1: Zorya’s Dawn some black metal riffs. Pavement Canvas tends more into the power metal corner with parallels to Nevermore and Lanfear. Occasionally I felt reminded of the glorious Eighties when a couple of freaks were into a genre back then called techno thrash. Especially Watchtower have left an impact on the two tracks that make it over ten minutes. So much for the positive aspects of this very good album. But there is also a little criticism to be doled out. The three minute instrumental Undercoat has no real suspense and feels drawn out despite its short length. The quiet, romantic Swimming Through Deserts is quite different from the remaining material and shouldn’t be to everyone’s taste. Yet I like this track which reminds me a little of Anneke van Giersbergen. Vocalist Nicki does a great job with her growls and also during the mellower moments, but it would help if she worked on sounding more powerful during the faster, melodic parts. Despite some tiny misgivings, Coma Ghost has turned out to be a very mature debut album that should be considered an entry for every well sorted progressive metal collection. With some vocal improvements and doing without instrumentals in the future, Effloresce will be able to come up with an even more compact record in the future.